Earlier this year (indeed since about Q3 last year) I had expected that the Fed would start the process of policy normalisation in June. That was predicated on the idea that the headwinds to growth were abating, the neutral real rate of interest was rising, and without a policy response we would see growth accelerate, unemployment fall more rapidly, wage growth pick up and with it inflation (eg see here and here). 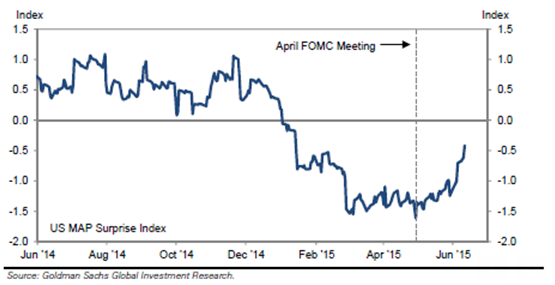 Three things have made a first hike from the FOMC on Wednesday highly unlikely. First, the fall in oil prices was deeper and longer-lived than I expected. That presented the Fed with a comms challenge of hiking when inflation was around zero, way below target. Of course, it is what the Fed expect inflation to be in around 18 months time that matters for policy today, but that can be hard to communicate to the public. Oil prices are well off their lows, and actually adding to monthly inflation more recently, so this is going to be much less of an issue as time goes by. (And remember it remains a boost for real household disposable income). The second factor is the growth slowdown in Q1. 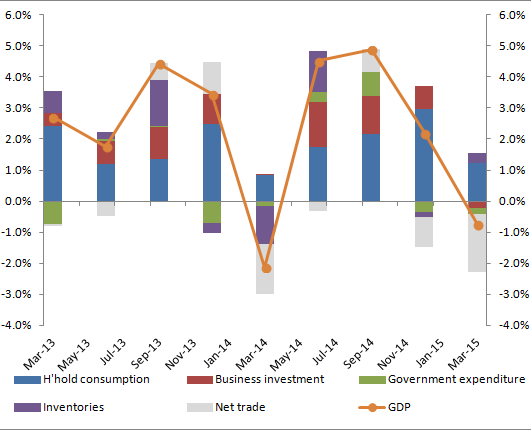 The first chart below shows the contribution to qtrly GDP growth (saar) since the start of 2013. While headline GDP growth has been noisy (we all know about the Q1 seasonal debate), the steady acceleration in household consumption growth through 2014, alongside decent, if not spectacular, investment spending suggested the economy had achieved “escape velocity”. However, that was once again thrown into question with the very weak Q1 growth outcome. This came as a big surprise to even the consensus, let alone those with more bullish views on growth. Perhaps the most surprising thing was that household consumption growth slowed, despite the boost to disposable income from the oil price decline. Instead of spending that windfall, households seem to have saved over half of it (for now at least). The surprise index moved sharply into negative territory in February and has remained, only recently starting to push back up towards normal level. Of course throughout this period employment gains remained strong (despite the miss in March), averaging over 200K a month this year. That is down on last year, but still fast enough to see the unemployment rate continue to decline (assuming flat participation rate). 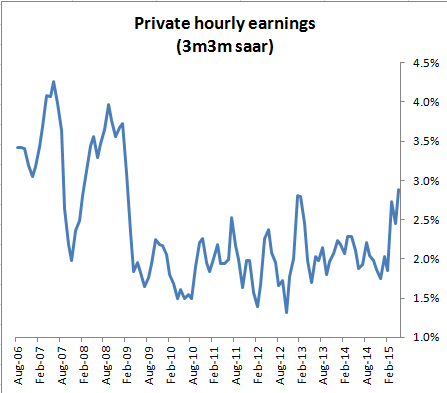 And we have recently seen some sign of hourly earnings finally starting to break out of their narrow post-crisis range. 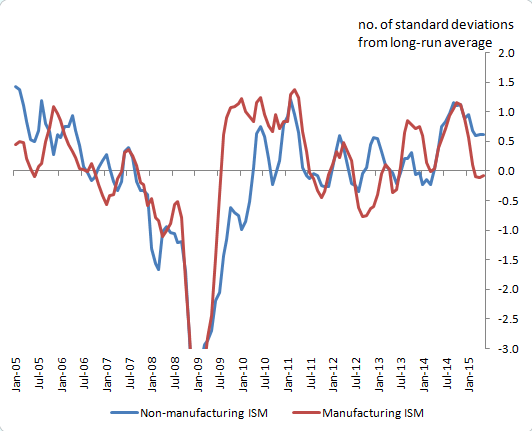 And more timely activity indicators, such as the ISM indices suggest that non-manufacturing remains robust, while manufacturing still struggles a bit. Which brings me to the third factor – the dollar. The effective exchange rate is up around 8% this year and around 18% since the middle of 2014. That is no doubt weighing on exports and manufacturing. The Fed have shown more concern about the dollar in this period of appreciation than at any point in the past. That probably reflects the increasing openness of the US economy, both trade and financial. But relative to say, the UK, it remains a large, relatively closed, economy (who happens to also be the international reserve currency). So while the Fed will put some weight on the dollar, it should not get the same attention as elsewhere. The three factors I have described above are enough to have delayed the Fed from hiking in June. But should they delay it to Sept, Dec or even later? In my view, the case for September remains fairly compelling. Headline inflation will start rising sharply at the end of the year, as the oil price fall drops out of the yoy comparison, recent activity indicators suggest that growth is back on track for Q2 (although the H1 average will still be very disappointing compared to what I expected at the end of last year) and the dollar has stabilised (for now). There are undoubtedly risks to the downside (domestic demand, global growth, financial stability risks), which could see the first hike delayed beyond September (the IMF have recently said they think the Fed should wait until next year – IMO they have massively overstepped their mandate in being so specific with their policy advice, but that is for another post). But if the economy broadly evolves as the Fed expects, then I think Sept remains the most likely lift-off date. Lastly, a quick comment on long rates. Dudley has said several times that if financial conditions tighten more or less quickly than the Fed would want, then they will adjust policy accordingly. Since the FOMC met in April, 10yr Treasury yields have risen by around 50bp to 2.35%. I do not think that this will be interpreted by the FOMC as the market getting ahead of them. Rather, that term premium was previously inexplicably low. So it again argues for delaying beyond June, but not much beyond that. I will post something on the statement, economic projections and the “dots” later.